Many evolutionists fail to see what is “hidden in plain view” for the same reason British Celts saw the wrong thing when Julius Caesar attacked them in 54 BC. Since the Britons never recruited multi-ethnic mercenaries, instead of seeing one invading force, they reported Caesar’s beach landing as an attack by combined armies of Rome, Libya, and Syria.1 They saw what their presuppositions led them to see. Likewise, evolutionists misinterpret many facts in plain view due to their erroneous assumptions. Last month’s article examined the evolutionary concept of ecosystem engineering, which considers the proactive way in which animals alter their environments.2 Although this is an improvement on the evolutionary view that organisms are passive recipients rather than active participants, it still misses the best lessons these animals teach. Two examples of such misunderstanding are considered below. This is a “bigger is better” fallacy, which is a manifestation of an anthropocentric (human-centered) viewpoint that evaluates a situation only from the human perspective. If something doesn’t seem big to us, it must not be significant. But ecologically speaking, which is more important: a huge elephant or a microscopic yet deadly virus? Which can ultimately have the bigger impact? Consider that Amitermes worker termites are about a third of an inch long. 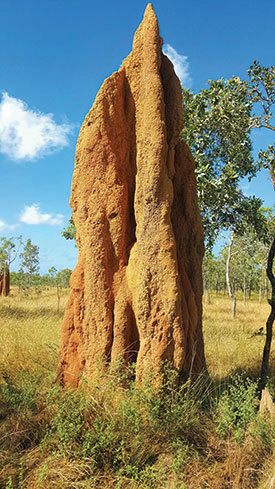 The termites-to-mound height ratio is thus 432:1. This is comparable to humans constructing spit-mud mounds 2,592′ high—in relative terms, almost double the height of the Empire State Building. To a human, the mound chimney might be just a big mud pile, but to a worker termite it’s an enormous skyscraper! 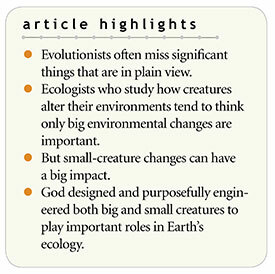 God designed and purposefully engineered both big and small creatures to play important roles in Earth’s ecology. Who Engineered These Small-Yet-Great Ecosystem Benefits? Like the ancient Britons, ecologists who embrace ecosystem engineering can miss what’s happening because they see what their presuppositions lead them to expect. But even more, they can miss the significance of what they see. Creatures proactively engage with and change their environments, but they don’t “engineer” anything. That glory goes to creation’s Architect and Bioengineer, the Lord Jesus Christ, who designed, built, and maintains all of these small-yet-great super-interactive ecosystems (Revelation 4:11). Cooper, B. 1995. After the Flood. Chichester, UK: New Wine Press, 58-59. Ecosystem engineering analysis improves upon earlier “keystone species” concepts yet ultimately fails to identify the true cause and logic underlying animal successes in filling various habitats. Johnson, J. J. S. 2019. Ecosystem Engineering Explanations Miss the Mark. Acts & Facts. 48 (3): 20-21, illustrating 2 Timothy 3:7. Gedan, K. B., L. Kellogg, and D. L. Breitburg, 2014. Accounting for Multiple Foundation Species in Oyster Reef Restoration Benefits. Restoration Ecology. 22 (4): 517-524. See also Pipkin, W. 2018. Freshwater bivalves flexing their muscles as water filterers. Chesapeake Bay Journal. 28 (7): 1. Cite this article: James J. S. Johnson, J.D., Th.D. 2019. Termite Skyscrapers Hidden in Plain View. Acts & Facts. 48 (4).